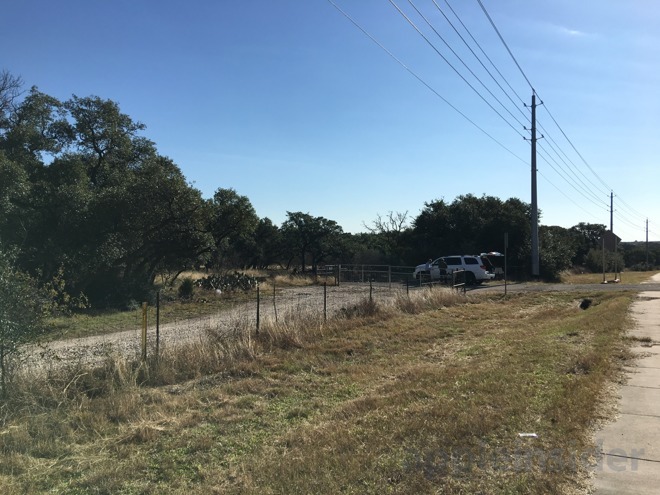 The planned build site is at the corner of Dallas Drive and West Parmer Lane, roughly a mile away from Apple's current Austin campus, also on Parmer. 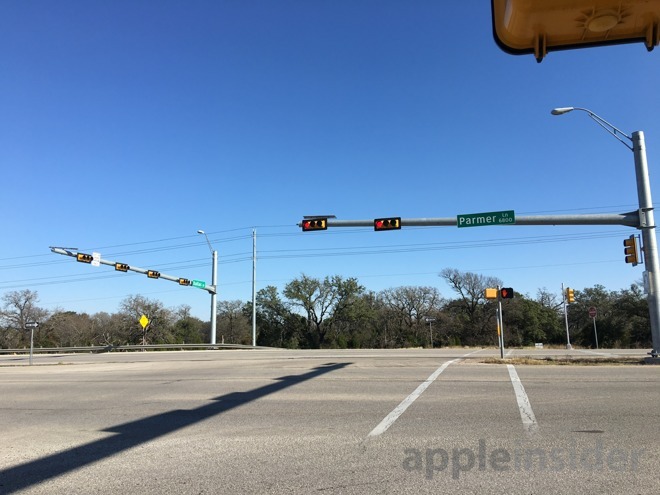 Parmer is a major thoroughfare in the city -- while traffic was relatively light when AppleInsider visited on Thursday morning, the road is often choked with traffic during rush hour in part because of Apple's existing campus, which employs thousands of people for operations work and AppleCare among other things. The Dallas/Parmer intersection. The main entrance will actually be slightly further east on Parmer. The immediate area is surrounded mostly by suburbs. 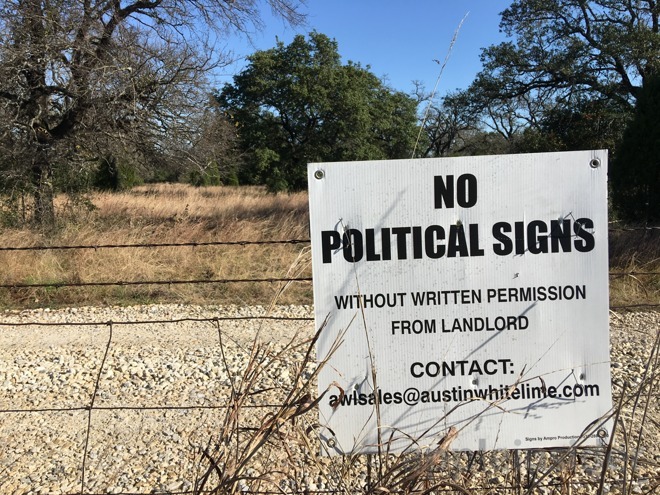 Some points of interest though are the offices of game developer BioWare Austin, McNeil High School, and Austin White Lime Co., which signs identify as the campus plot's current landlord. A number of tech businesses have offices in north Austin, such as Google, Qualcomm, Samsung, and National Instruments. Dell's global headquarters is less than 15 minutes away in the suburb of Round Rock. 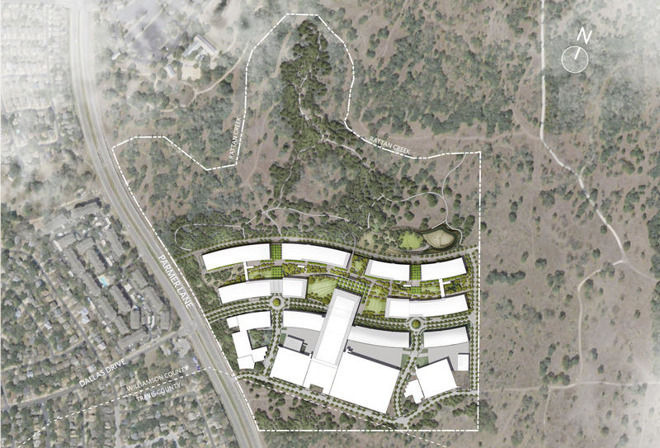 Apple's planned space shows little to no development so far. 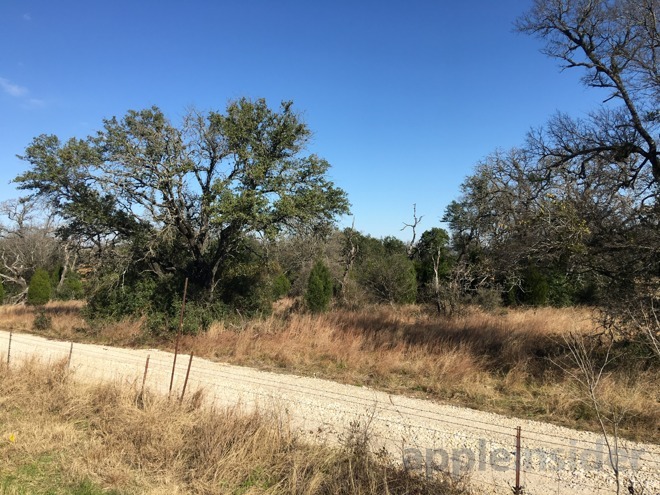 It's covered mostly by brush, trees, and cacti, with dirt and gravel roads tracing through some sections. 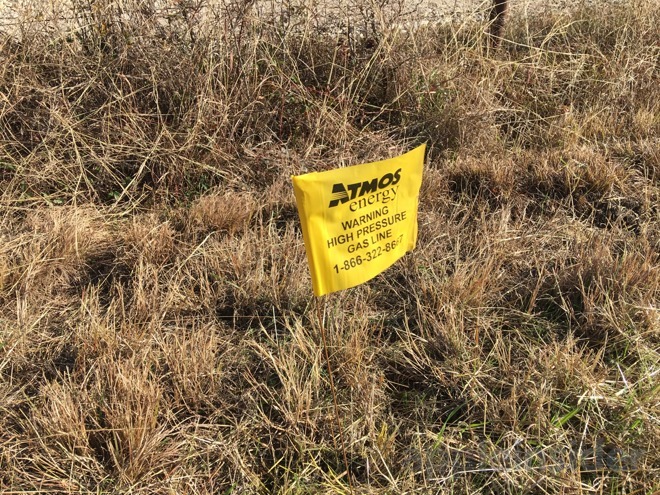 We did see signs that a gas line was being installed. Perhaps more interestingly, we spotted a pair of people with an unmarked white SUV parked in front of the future main entrance, preparing to fly a drone. This wasn't a consumer model -- rather it was a DJI Inspire 2, which can shoot 6K video and has a top speed of 58 miles per hour. 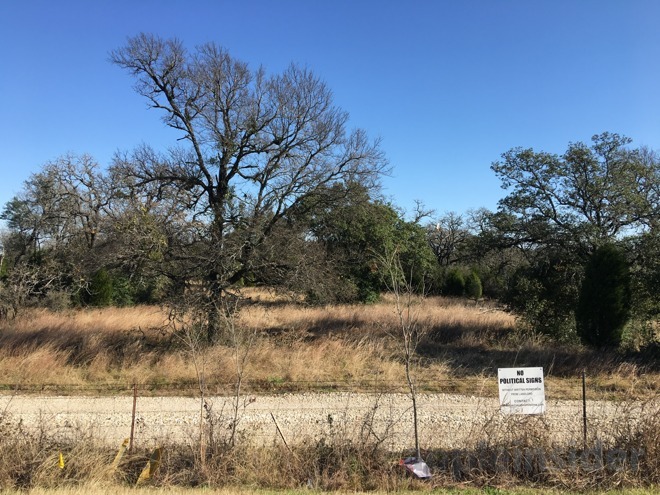 When it's full and complete the new campus may push Apple's Austin workforce as high as 15,000 people, which would make it the biggest private employer in Austin proper, despite companies like Amazon's Whole Foods being headquartered there. Some of the 5,000 new jobs will be in engineering and R&D, which could make Austin a source of next-generation products. An official Apple site plan. AppleInsider will be returning to the site regularly, to update you on the state of construction and progress of the build. Thanks, nice to see such an early impression of the site! Looks like Apple is building additional leverage against Cali tax madness. Good. Nice to see them doing that. I am pretty sure Amazon has reconsidered its investment plans in Oregon, as well. No interview with the tumbleweeds? When asked for comment, the tumbleweeds refused our inquiries. Sources familiar with the matter not directly affiliated with the tumbleweeds are glad to see them go. Iirc they’re foreigners so maybe they simply didn’t understand your inquiry? Did you try addressing them in Russian? Native languages are always appreciated. I still don't understand just what all these employees actually do. For the size of the product line and the pace of new releases, it doesn't seem like Apple should need the number of employees that it has, unless they're planning an entirely new line of businesses that we don't yet know about. The other strange thing is that for all the employees, when we hear reports about specific development teams, those teams tend to be relatively small. Or, we hear about people being moved from one team to another, as if Apple doesn't have enough employees. None of this makes sense to me. Your entire problem is that you believe the rubbish that is published about Apple on a daily basis. mostly R&D, I suppose. Software development takes a lot of time (unless it is a small app with 1.5 buttons and 1.3 text fields). Also, I am pretty sure you have very little idea of the size of the code base Apple has. Testing and changing that, and testing again takes time, even if you use so called agile pipelines... Name one company that releases similar products of similar levels of complexity, while employing a fraction of what Apple has. Another thing to consider is that when you see Apple employee numbers, it usually includes retail which as I understand, far outweighs actual design, engineering & management in Cupertino. When these hard numbers are compared to the likes of Google, Microsoft, Samsung etc. they look similar, but in reality the number of people working on hardware & software is vastly smaller. AFAIK a pretty good portion of the  workforce in Austin is customer service. Yet people always wonder why apple moves so slowly. Relatively, they’re a considerably smaller company. And I seriously doubt this place will be packed the week after the doors open. I would imagine Apple is building for future growth up to a decade out. Migrants, to be precise. They’ll be moving on prior to construction. It’s their nature. QA and QC efforts associated with those products. and a fairly large number of IT staff to support local networks in each facility, support users and keep the internal Apple machine running smoothly. The list truly does go on, doesn’t it? It’s not a matter of just current products versus future products, there’s a lot of richness and detail to creating and advancing a $220 billion+ revenue beast. Is it the tax, or is it the real estate rises due to available tech salaries and its spending power? Hard to blame the state for the actions of the private market, right? I’m an enterprise software developer. Go to their employment site and select the software developement category and review the hundreds of listings. They’ll give you an idea of the many, many projects that any normal corp has going on in the background. Software runs the world, and it’s not limited to what’s on your phone. What is that, a ranch? Looks like an undeveloped lot to me. Perhaps the guys with the uberdrone can tell us more. Time for the drones to watch over the development. See, now this should be the sign on every AI thread!! One, we don't have tumbleweeds in Austin. That is more of a West Texas thing. And B, take a look at Apple's job listings for Austin (you can set a filter). You'll see that some are customer service, or software engineering, but a lot of them are hardware engineering. I think most of the jobs in engineering outside of Cupertino are of a more mundane nature. It's the unglorified, nuts and bolts work that ultimately results in the functioning product envisioned and created by the upper tier engineers in California. In Apple world, all workers outside of the mothership are considered B Team one way or another. Something I found funny - the buildings just North of that site, where EA and Paypal are, used to be the old Motorola Parmer Lane facility. It was originally built for Apple, but Apple decided not to move in, and Motorola leased it instead. The team responsible for the cameras in Apple products has over 800 people, at least according to an Apple promo video. Also read somewhere that Apple Maps has over 7,000 employees (and that is a smaller workforce than Google Maps).